A little over a month ago, I was blessed to travel with CNEWA president, Msgr. John E. Kozar, on a pastoral visit to Lebanon. While there, we toured schools, medical clinics, a seminary, and refugee camps to see just how CNEWA accompanies the poor, suffering, and displaced throughout the Middle East. For me, it was a humbling trip — one that made me eager to return home and share with our donor family stories of the real need facing this community, as well as my own first-hand accounts of the tremendous good our donors have made possible. With thanks to the O’Hara family and, in particular, their son Christopher, we were able to share a little about that trip recently at Gallagher’s Steakhouse in midtown Manhattan. Christopher is a freshmen with Georgetown University’s Edmund A. Walsh School of Foreign Service who, as a junior at Chaminade High School on Long Island, wanted to reach out to help people in need. (Coincidentally, Father Walsh was CNEWA’s first president). Last year, Christopher organized a special evening to raise awareness and support for the Christian community in the Middle East and the people they serve. During this year’s gathering, Msgr. Kozar not only shared stories from our trip to Lebanon, but also about his recent trip to Iraq as one of the first Westerners to visit some of the liberated towns on the Nineveh Plain. Msgr. Kozar also spoke of a convent and a church he toured where extremists had used the buildings as target practice and ransacked every icon and liturgical book. He spoke of the courage of a group of parishioners who came with brooms to clean the church so that they could celebrate Easter Mass — with hardly any parishioners present. The need has been particularly great across the Middle East lately, and that’s why an evening bringing together some of CNEWA’s friends and supporters in the greater New York City area was a real opportunity to provide an update of what’s happening — and make a difference at the same time. More than that, is exciting for us at CNEWA to know that we count young people among some of our most faithful supporters. Christopher O’Hara’s efforts to raise awareness was inspiring to another group of youth, a volunteer initiative calling themselves “Relief United,” who recently held a Battle of the Bands concert to help Syrian refugees. (You can read about their efforts here.) Together, the students were able to show that the youth of today can offer powerful and faithful acts of generosity and mercy. All of us here at CNEWA could not be more thankful for their cheerful and enthusiastic service on our behalf. If you’d like to support Christopher in his efforts to make an impact in the lives of this struggling community of faith in the Middle East, you can make a donation here. A menorah and its shadow are seen in one part of an exhibition on the menorah at the Vatican on 15 May. The second part of the exhibition is at the Jewish Museum in Rome. The Vatican Museums and the Jewish Museum of Rome are exploring together the significance of the menorah, although they also give a nod to the centuries-old legend that the Vatican is hiding the golden menorah from the Temple of Jerusalem. A two-part exhibition, one at the Vatican and the other at the Jewish Museum of Rome, prominently features a replica of the 1st-century Arch of Titus, showing Roman soldiers carrying the menorah and other treasures into Rome. From a coin minted in the century before Christ’s birth to a 1987 Israeli comic book featuring a superhero with a menorah on his chest, the exhibit, “The Menorah: Worship, History and Myth,” documents the use of the seven-branched candelabra both as a religious item and a symbol of Jewish identity. The exhibit is scheduled to be open through 23 July. One ticket includes admission to the main part of the exhibit in the Charlemagne Wing just off St. Peter’s Square and to the Jewish Museum, located about a mile away at Rome’s main synagogue. Among the pieces displayed at the Jewish Museum stands a towering mosaic inscription describing treasures buried at the Basilica of St. John Lateran, the cathedral of the Diocese of Rome. Dating from the 13th century, while the Crusades were raging, the mosaic’s 37-line inventory includes “the golden candelabrum” Titus brought to Rome. The legend has persisted for centuries that the Vatican is hiding the solid gold menorah — if not at St. John Lateran, then in a cave at the Vatican. Jewish religious and political leaders continue to ask the popes to return the piece. Arnold Nesselrath, director of the Department of Byzantine, Medieval and Modern Art at the Vatican Museums, said the mosaic from the time of the reign of Pope Nicholas IV is the last the Vatican heard of the famous menorah. Excavations under the altar of St. John Lateran and the surrounding area in the early 20th century turned up no trace of the treasures. Still, he said, the legend documents just how important the menorah is in Jewish culture. Francesco Leone, the art historian who prepared the exhibit catalogue, told Catholic News Service the most historically reliable explanation of the Temple menorah’s fate is that it was taken as booty from Rome by the Vandals or Goths before the end of the fifth century and melted down. The oldest object in the exhibit is the “Magdala stone,” a carved block from a synagogue in the Galilee excavated in 2009. The stone, which has a carved menorah on one side, is from before the time of Jesus. In this image from 2004, a Melkite Greek Catholic priest from southern Syria sits with his family. 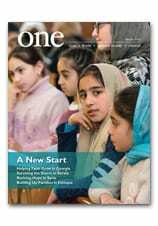 Read about the Christian heritage of this troubled country in Deep Roots in a Fertile Land in the May-June 2004 edition of ONE. In this image from March, a Syrian refugee widow, 25-years-old Hawla Shafi, who fled from the Syrian town of Raqqa, is seen with her children in front of an abandoned electric transformer building in Sanliurfa, Turkey. Raqqa has just been recaptured by the opposition forces.